The Zotac Gaming GeForce GTX 1660 Ti with its price tag of Rs 25,699, just slightly cheaper than the Real Time Ray Tracing capable RTX 2060, making it appear like a not-so-value for money proposition. 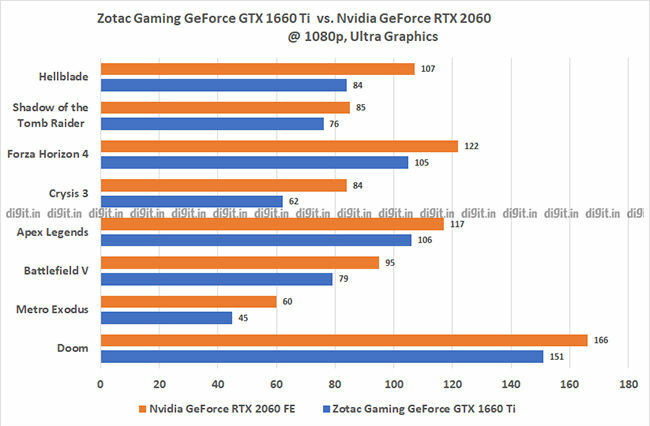 However, in our tests, we found that when gaming in full HD (1920x1080) and graphics settings maxed out, the Zotac Gaming GeForce GTX 1660 Ti is roughly only 16 percent slower than the Nvidia GeForce RTX 2060. With the graphics settings turned down to High, the difference is even smaller at just 13.5 percent. It's only when we start gaming at 2K do we start to see notable differences in performance between the two cards. This makes us conclude that for those who want reliable 1080p gaming performance without breaking the bank, the Zotac Gaming GeForce GTX 1660 Ti offers really good value for money. IF you’re a PC gamer or someone who’s been flirting with the idea of getting into PC gaming, there’s no better time for it than now. Nvidia has particularly been on a roll with their releases, offering everything that falls between the gamut of “price no bar” to “budget conscious gaming.” The new RTX series of GPUs brought with them the ability for real time ray tracing for games that support the feature, along with Nvidia’s Deep Learning Super Sampling (or DLSS), but all at a slightly higher price point than previous generation cards. For those who weren’t particularly “feeling” the RTX goodness, Nvidia launched the oddly named GTX 1660 Ti, a graphic card that the company said would help move all the 9-series (or older) GPU owners into the era of Turing. Since Nvidia isn’t making any Founder’s Edition cards for the GTX 1660 Ti, Zotac India sent us their Zotac Gaming GeForce GTX 1660 Ti so that we could understand just where the performance needle falls for this card. Our standard test bench is based on an Intel Core i9-9900K processor, but for benchmarking the GTX 1660 Ti, it made sense to use a lower-end rig. Our thinking for this is, if you can afford an i9-based setup, you’re probably capable of affording the more expensive RTX cards. For the GTX 1660 Ti, here’s the test bench we used. The above rig is actually my personal machine, which was built for the purpose of video editing, hence the excessive RAM and NVMe storage. The monitor was particularly chosen to ensure that we’re able to record frame rates as high as they can go without maximum out the refresh rate of the monitor. Although, as you will see from our findings below, a 144Hz monitor should be more than enough for anyone who chooses to go ahead with the GTX 1660 Ti. We also threw in the Nvidia GeForce RTX 2060 Founder's Edition for reference. The test process involved running a few standard synthetic benchmarks, followed by recording the frame rates for 8 popular games. This includes Doom, Battlefield V, Metro: Exodus, Apex Legends, Crysis 3, Forza Horizon 4, Shadow of the Tomb Raider and Hellblade: Senua’s Sacrifice. The idea was to get a healthy mix of games that have varying effects on the PC hardware. All games were installed on the NVMe drive for optimum performance. All games were played twice, once with the graphics settings at the highest offered by the game, and a second time with graphics set to one lower than the highest. For the sake of clarity, we will designate the highest graphical setting for all games as “Ultra” and the one below highest as “high”. We tried to ensure as far as possible to play the same parts of each game. We ran this test process multiple times to ensure there were no anomalies, or one-off performance hits or boosts. Here are the results. We rely on a host of popular benchmarking tools to get comparable numbers. Synthetic benchmarks offer a level playing field, resulting numbers are just scores that are statistically comparable. In this regard, the numbers we got on 3DMark’s suite of tests are listed below. 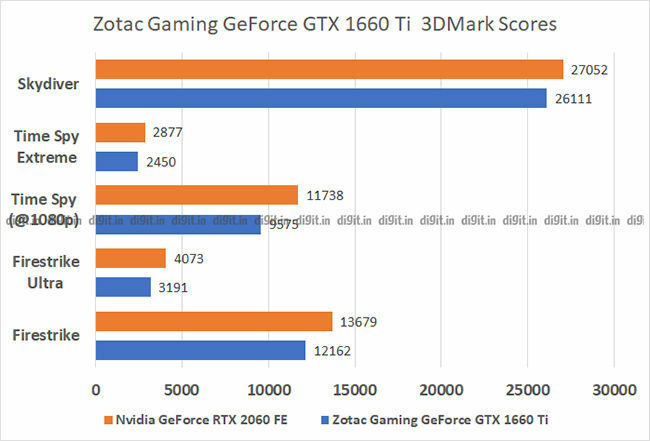 The Zotac Gaming GeForce GTX 1660 Ti surprisingly had an overall score delta of a little under 14 percent in comparison to Nvidia’s RTX 2060. However, what’s interesting is that for higher resolution tests like FireStrike Ultra, which runs at 4K, the score difference was roughly 22 percent. For 1080p tests, however, the difference in scores was between 11 and 14 percent. This leads us to believe that for 1080p gaming, the Zotac Gaming GeForce GTX 1660 Ti may not be such a bad choice, especially if you’re on a tight budget. However, you’re not going to buy a GPU for running benchmarks. You’re going to be playing games on it, or editing videos, so let’s get straight to it. We played 8 games on the Zotac Gaming GeForce GTX 1660 Ti. Our testing was designed to reveal how many frames per second could the card push at 1080p, with each game set to its highest graphical setting. The only exception to the “highest setting” rule was Metro: Exodus, where the Extreme setting doesn’t really contribute to any visual fidelity but is only designed to shame the most beastly of systems, or at least that’s what the game’s developer 4A Games says. For Metro: Exodus, we used the Ultra and High graphical settings. Here are our observations from each game’s multiple runs, starting with Doom. Bethesda’s Doom is a game that emphasizes movement even over the blood and gore. This ultra-fast-paced shooter ran butter smooth for us on both Ultra and High settings when we played the game at 1080p. We were quiet surprised to see the game give us an average frame rate of 151fps on Ultra settings and 166fps on High settings. Even in the most intense and heavily populated fight sequences, the 1660 Ti just did not let us. Impressed with how the GPU fared in Doom, we stepped things up to Battlefield V.
Battlefield V is a lot more demanding of the CPU and GPU than Doom, but very seldom did our Intel Core i5-6600K hit 100 percent usage during our test runs. For consistency, we stuck to the Tirailleur chapter of the single player campaign. For the game set at Ultra, we clocked an average frame rate of 79fps while the High setting delivered a smooth 84fps (Average). However, there were instances in the game where we noted clear stutter. This was seen at 2 points in the map, one while charging up the hill and another time when fighting off the ambush by German forces. The lowest frame rate we got during our Ultra run was 46fps and 51fps for the High setting. There was a certain amount of sadistic pleasure involved when putting the Zotac Gaming GeForce GTX 1660 Ti through the Metro test. The game has already brought a lot of high end gaming systems to shame, so we weren’t very hopeful of the results from our modest rig. Even so, we managed to clock an average of 55fps on the High setting and 45fps on Ultra, however, you could achieve a 60fps average if you use the medium graphical settings. Even so, there are points in the game where you experience stutter. Without giving any plot points away, frame drops should be expected during heavy battles and even at times when there’s nothing on the screen except the vast desolate snowscape of Russia. After a beat down by Metro: Exodus, we figured it was time to let the card take it easy. We hence fired up Apex: Legends, the new Battle Royale title that is taking the PC gaming space by storm. Apex: Legends isn’t a very demanding game, with clean and simple graphics, but features vast draw distances based on where you stand in the map. 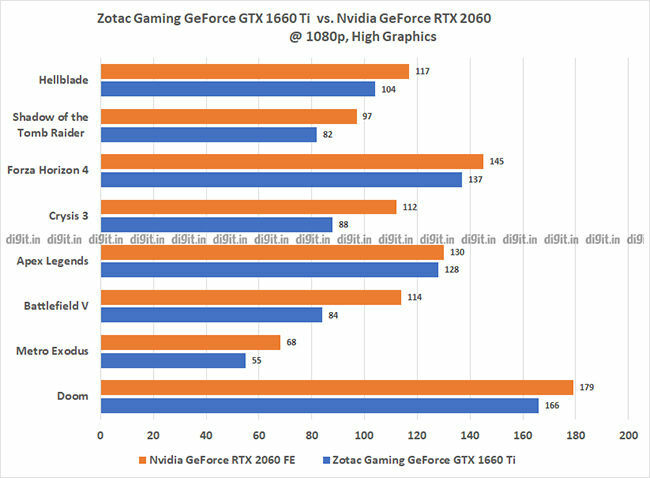 Irrespective, the Zotac Gaming GeForce GTX 1660 Ti managed to maintain an average frame rate of 106fps with the graphics set to ultra and 128fps when the graphics were set to high. Suffice to say, if Apex: Legends if your allure to PC gaming, the 1660 Ti may be the only GPU you need for now. This becomes especially more interesting when you consider the fact that the RTX 2060 delivers an average of 117fps when the graphics were set to Ultra and 130fps with the graphics set to High. If Battle Royale games are your thing, then the 1660Ti might just end up being the perfect value for money card. A title with some very complex landscapes and lightwork, Shadow of the Tomb Raider offers a rather a unique experience when benchmarking GPUs. There are areas in the game that are extremely forgiving of the GPU and then there are instances when we saw even out RTX 2080 break a sweat. 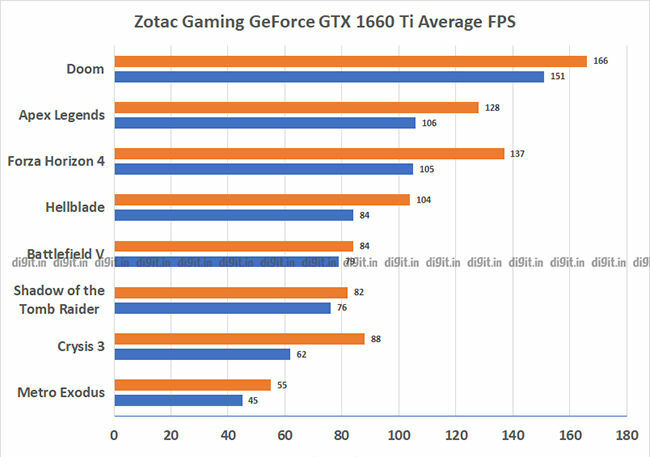 For the 1660 Ti, however, the numbers for the most part, look rather favourable. At the very highest graphics setting, we clocked an average frame rate of a 76fps, a very respectable number for a game like this. Turning the graphics setting down to high resulted in an average frame rate of 82fps. While we didn’t experience any stutters in the game, the load times were abnormally long, despite the game being loaded onto an NVMe drive. The conclusion to an epic trilogy, Crysis 3 wasn’t quiet the system melter like the original game, but its modern-day version is still rather demanding. Our GPU still manages to push the game to run at an average of 62fps on Ultra graphics settings and a generous 88fps with the graphics settings turned down to high. Even in the densest of fight sequences between Prophet and the Seph, with all the lightning bolts and particles flying around, there isn’t a single hiccup. The seventh game in our test process is Ninja Theory’s award-winning title Hellblade: Senua’s Sacrifice. This deeply unsettling, yet gripping game. It’s a masterpiece of story-telling, through both its visual and auditory treatment. A game that relies on players solving puzzles using clues that could be hidden in floating mirages or shadows cast across vast ruins. The Zotac Gaming GeForce GTX 1660 Ti runs Hellblade at a butter smooth average frame rate of 84fps at Ultra settings while on High, we clocked 104fps. Interestingly, at 2560x1440, the game runs at an average fps of 40 at Ultra settings. 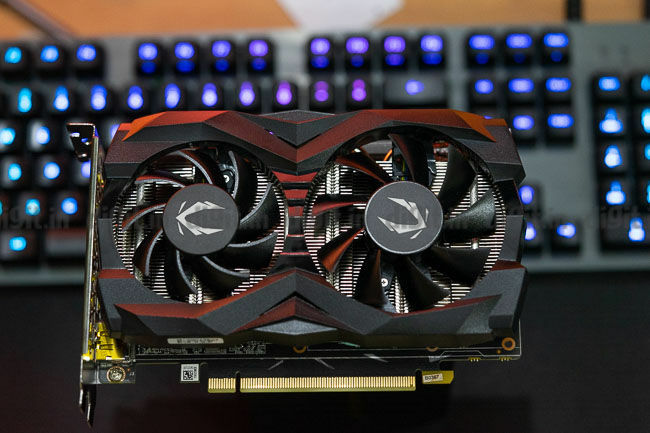 To cut a long, detailed story short, the Zotac Gaming GeForce GTX 1660 Ti comes across as a perfectly adequate card for anyone who wants to get into PC gaming without breaking the bank. All the games we played on the 1660 Ti ran at comfortable frame rates above 60fps, save for Metro: Exodus. The card outperforms the older Nvidia GeForce 1060 by a decent margin and in fact, comes very close to delivering the same level of performance for 1080p gaming as the slightly more expensive RTX 2060. The Zotac Gaming GeForce GTX 1660 Ti is perfect for casual gamers and even those with a slight competitive streak, but those who are looking to drive a monitor with 144Hz (or higher) refresh rate would be better served with a more high-end card. To conclude, we highly recommend the Zotac Gaming GeForce GTX 1660 Ti not only for those building a gaming rig on a budget, but also those who are clear that they only want to game in 1080p, and absolutely blazing fast frame rates are not really a deal breaker. It is hard to not see the value in this kind of performance when it comes at a price of Rs. 25,699.